Then I saw the Grand Canyon and ate a buffet! Welcome to Coupon Puppet’s first video since relaunching with all Las Vegas travel deals! We think you’ll agree, it’s a catchy little number. Better yet, all the deals we sing about are absolutely true! You CAN save big on your hotel rate with great deals from Caesars properties and Hotels.com. $50 off at Cirque Du Soleil is NOT an exaggeration…you can currently save that much at the Beatles LOVE show and Ka! We’ve got plenty of other cheap Las Vegas show tickets as well, like those Elvis and Bee Gees tribute shows from the video. Our discounted Las Vegas tours to the Grand Canyon and beyond are great breaks from the hustle and bustle of The Strip. And yes, that was a Pawn Stars tour coupon flashing before your eyes. Over here at Coupon Puppet, we love Las Vegas. Hopefully that enthusiasm shows when you are shopping for deals. Be on the look out for Las Vegas show reviews and hotel reviews, coming soon! And more videos starring your very favorite blue sock, of course. If there are any Vegas travel deals you are searching for in particular, please let us know and we’ll try to feature them on the site. We’re here to help! Viva Las Coupons! 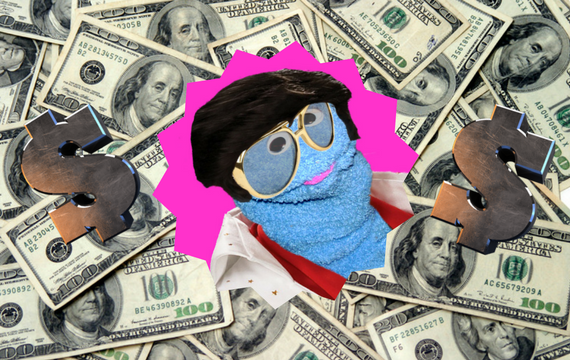 Coupon Puppet Loves Saving You Money With Vegas Travel Deals!